Why Leg Workouts are Important!! Next time you go to the gym, take a look around and you will notice that the majority of people (men especially) are working their upper bodies, and NOT doing leg workouts. In fact, most people focus on training their upper bodies and neglect their lower half. Why is that?? 1. Leg muscles aren’t really “showy” and everyone would rather work on having a large chest, arms, and shoulders that everyone can notice. Seriously have you ever asked a guy to flex his quads?? Not usually! (Well I have, in fact, I LOVE I man with strong legs) Unfortunately, upper bodies always get the attention. The mistake of avoiding hard leg training is costly, and there are two main reasons as to why. If you have a large and muscular upper body, and under-developed legs, you would look quite ridiculous (I see lots these “golf tee” body shapes all over the gym). Think about it, huge pecs, bulging arms, cannonball shoulders, and a wide muscular back, sitting on top of toothpick legs. It looks funny, just saying! So if you don’t already do so, include a great leg workout in your weight training routine every week. If not for the large, strong and muscular legs you will develop (who doesn’t want that?! ), then do it for the overall gains you will experience in your upper body! OH and one more thing, DO NOT AVOID SQUATS! Unless, of course, you can’t physically do them (injury, muscles too tight, etc), or you do them wrong! Have a personal trainer check out your squats before you go ahead and load up the weight on your back because you WILL hurt yourself. Barbell squats are not the only way to do squats…there are MANY other ways of doing squats which I will cover in my next post…They are such a great exercise for building mass all over your body, and can’t be replaced with any other exercise. I train my legs on Saturday, how about you?? I will share my current leg workout and my favourite leg exercises in my next post so stay tuned…. Sound familiar? Are these thoughts coming from you? Many women (and men) who struggle with their weight have persistent negative thoughts about themselves. These thoughts decrease our self esteem and can lead to feelings of hopelessness, doubt and discouragement. Want to learn some tricks that will help boost your self confidence? Well read below because what’s even more important than working hard in the gym and eating clean is cheering yourself on! According to Oxygen magazine “repeating an encouraging statement can help you push through that last set at the gym, overcome a plateau or put the brakes on a cranky mood”. I couldn’t agree more! 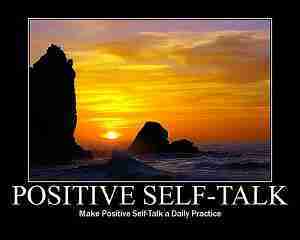 1-Keep wishy washy language out of your personal self talk-avoid words like ‘maybe’ and ‘can’t’. 2- Keep it positive! Turn negative thoughts upside down. Instead of saying something like “I won’t eat any bad foods”, tell yourself, “I’m eating healthy, clean foods!” Focusing on the positive goes a LONG way! 4-Keep it realistic-Avoid exaggerating. Instead of saying “I am the fittest woman in the world!’ (which you might be!) say, “I am the fittest I have ever been!” This will help you believe in your self-talk and make the process feel more natural. 5-Keep it focused on you-Use “I” statements. Instead of “Working out makes me stronger”, tell yourself, “I am stronger thanks to my workouts (and my trainer haha ;))”. Doing this puts YOU in control. 6-Remember where you started! This is a big one and something that many of us forget. When you are having a down day or are being hard on ourselves because our body/mind might not quite be where we want it to be…think about where you started, how you felt, what you looked like, how often you were working out…and THAT should bring a smile to your face and will motivate you to keep going! Simply by stepping back and giving yourself a moment, you start taking charge of your mind and begin to realize how much thinking influences your mood and your being. As I mentioned at the beginning of this post, permanent, healthy weight loss isn’t just about nutrition and exercise. It’s about a different way of thinking and living. 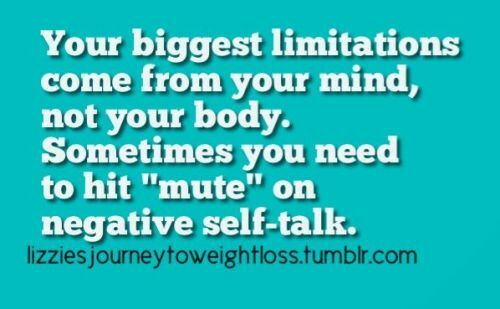 Consider how negative self talk prevents weight loss success and use these rules as a simple strategy to help you feel positive and stay motivated to continue your healthy living efforts. While both should be a part of your daily intake (fats should make up around 35% of your diet) coconut oil is best to cook with while olive oil is best served at room temperature (in salad dressings etc). I cook almost everything in coconut oil, my egg whites in the morning, chicken, veggies…the list goes on!! Coconut oil is made up of medium chain fatty acids which are sent directly to your liver where they are quickly converted into energy rather than stored as fat. It contains high levels of lauric acid which is a powerful antioxidant that may help the body absorb nutrients and shed weight. It is also anti-microbial and may help fight signs of aging (you can use it on your skin). Coconut oil has a higher smoke point than olive oil. Why does this matter? Unrefined olive oil has a lower smoke point (320F) than unrefined coconut oil (350F) and thus isn’t the ideal oil for higher temperatures. Oils can break down beyond their smoke points which starts to change the molecular structure and integrity of the oil. That being said, coconut oil is much more versatile which makes it ideal for cooking and baking while olive oil is best for cold dishes. They taste and look different but both are full of health benefits! Olive oil has two standards, virgin and extra virgin. Both varieties come from crushing and pressing fresh olives. The result, as everyone is familiar with, is a light to medium golden yellow color and fresh aroma. The taste profile of olive oil is mild and smooth making it perfect for salads and pasta dishes. The coconut oil is a stark, bright white color and has a fresh coconut smell. The taste profile of coconut oil is light and sweet, with subtle hints of actual coconut. The flavor is wonderfully versatile in both savory and sweet dishes. What surprises most people is that coconut oil can change between a liquid and solid state very easily. Whenever the temperature is above 76 degrees Fahrenheit, coconut oil will be liquid. Below 76, coconut oil is a solid. Where can you buy it?? Some grocery stores carry it in their “organic” section or you can always find it at your local natural food or supplement store. For those of you how are still stuck in the 90’s and believe that you will lose weight eating a “low fat” diet well GET WITH THE PROGRAM! We need to consume fat in order to burn fat! If you want to read more on this check out an old blog post all about the importance of having healthy fats in your diet! Have a fantastic weekend and bundle up, it’s COLD in Ottawa! 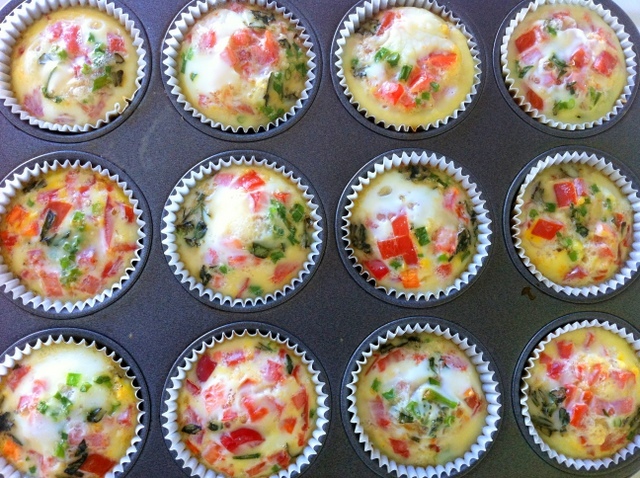 My client Katie sent me a picture of these yummy “clean egg muffins” she made. I asked her for the recipe immediately and thought I’d share it with you! She found it in Oxygen Magazine and I found another person’s version of it online…. 1. Chop up all of your veggies! Then mix them together in a large bowl. 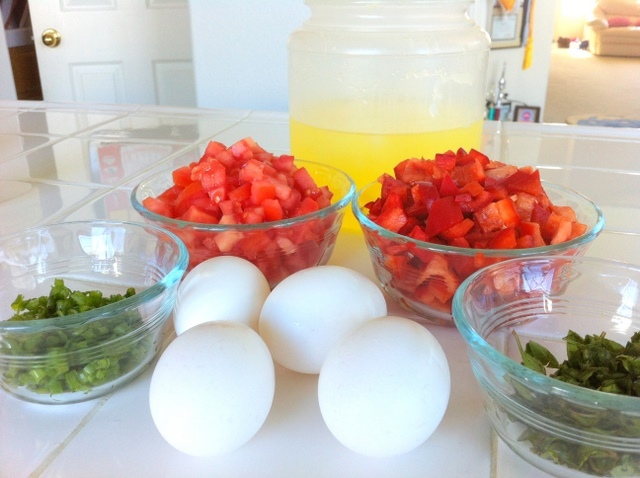 Next, whisk your whole eggs and egg whites together in another bowl. 2. 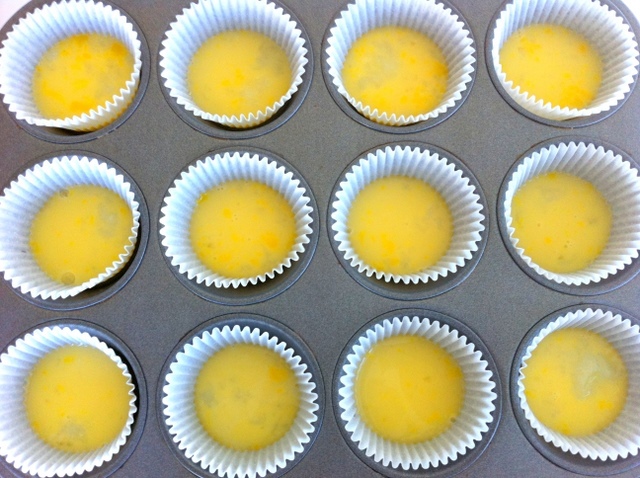 Line your muffin tins with cupcake holders and spray with PAM. If you don’t have liners, you can directly spray PAM onto the tin. Then fill your cups with about a tablespoon of egg mixture. 3. Next fill the rest of the cup up with veggies! Then fill to the top with the rest of your eggs. You can pretty much fill to the brim. 4. Pop them into the oven at 375F for about 20-30 min or until you see that they are firm on top. Yummy!!! I was so hungry. Couldn’t wait to eat. 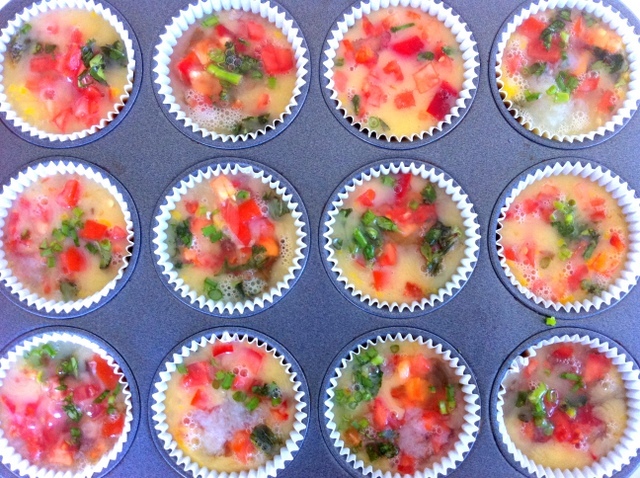 Simply peel the egg muffins out of your liners and serve with some salsa. Super yummy!!!! 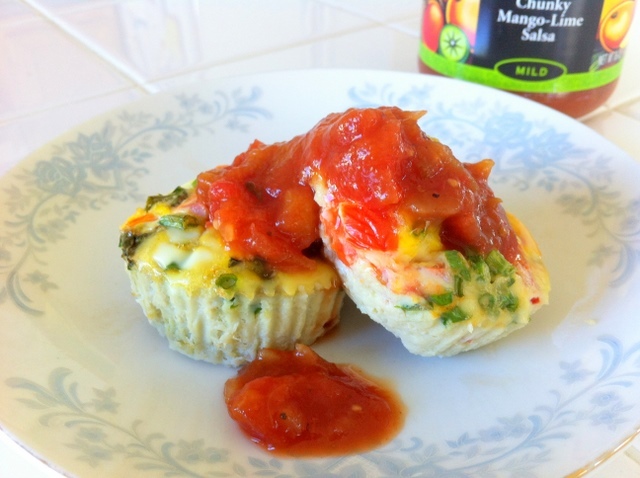 This is a great meal for those of you who have super stressful mornings and don’t have time to make an omelet. 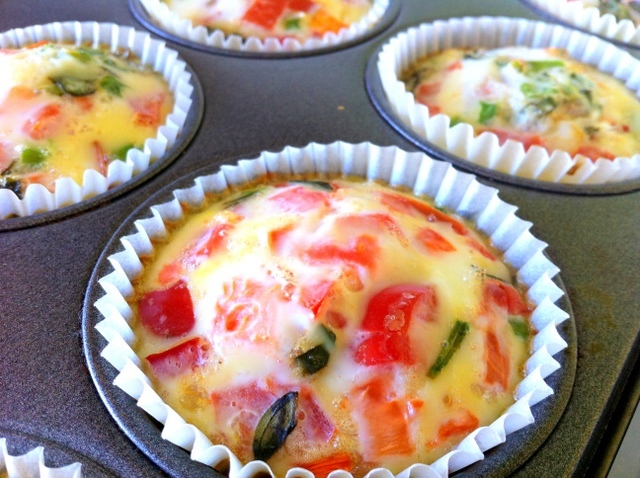 If you make 24 of these you can eat them for breakfast or snacks for the rest of the week. NUTRITION INFO: total recipe: 1061 cals, 34g fat, 32g carbs, 144g protein. per muffin: 44.2 cals, 1.4g fat, 1.3g carbs, 6g protein. Amazing! I hope you make them as they will save you so much time in the morning!!! Just refrigerate and pop in the microwave for around 30 sec! Unfortunately these wonderful egg creations are not a part of my meal plan but trust me, as soon as my competition is over, I will be making these ALL the time! 1.3 g of carbs and 6 g of protein per muffin?? AMAZING! Are you getting enough greens!? Why should I take it? It is a 100% vegetarian herbal formula that provides green nutrients, botanicals and vegetables in a pleasant cleansing liquid and is a great way to get all your essential green nutrients if you have a hard time eating lots of vegetables and salads. When do I take it and how much? In the morning on an empty stomach, 1/2 a capful or 1 tbsp of Vital Greens mixed with 1 cup of water. What’s in it? Chlorophyll, aloe vera, ginseng, ginko biloba, spirulina, beet root etc, as well as a list of super foods and vegetable juice complex. What does it taste like? A nice light mint flavour, very refreshing! Where do I buy it and how much does it cost? At any health food store. A 500mL bottle which will last you over a month (if you take it everyday) costs less than 30 dollars! Where can I get more info? Check out this website…. 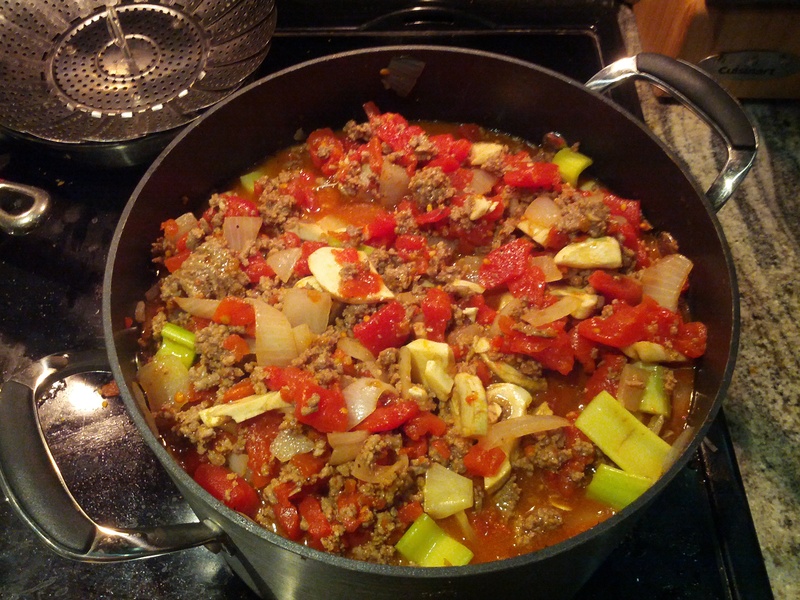 Super easy (and spicy) paleo chili recipe! Thanks to my client Mike who has recently discovered and is following a paleo diet and has been getting amazing results! This was one of the recipes he came across and modified to make it even more yummy (and spicy apparently!) It is so easy and the best part?? It is dairy free, grain free, and all around CLEAN and healthy! Plus it is super easy to make! My sister made it over the weekend and has been raving about it (right Katie?)! Check out the recipe below…it makes a lot so it is perfect for someone who doesn’t like to take a lot of time preparing meals everyday, you will have enough leftovers to last you a few days! 2. Combine all ingredients in a large pot or crockpot and let it simmer for 4-6 hours on low. On a side note, my 16 week figure contest prep has begun! Stay tuned for updates on my workouts, my diet and progress. I took ‘before’ pictures on Saturday, and well, let’s just say I have a lot of work ahead of me but I am ready to work hard and be in the best shape possible by April 27th!! Looking forward to going on this journey with 2 of my clients and quite a few other friends and clients at LC Fitness Studio. Team Ottawa is ready to rock the WBFF Show in Montreal! What goals did you set for yourself this year? What’s your plan to get there?